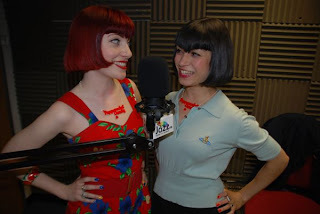 Rock My Vintage Blog: Not so Tatty..
We are massive fans of kooky jewellery brand Tatty Devine and were super excited to hear that they are releasing a new necklace in collaboration with the fabulous Broken Hearts DJs to celebrate the launch of their new radio show "Peppermint Candy" on Jazz FM. The colour popping red necklace will feature the show's name together with a cute heart charm. The Devine duo will be joining the swing loving DJs on their show this Thursday giving listeners the chance to win the necklaces. A bit of a no-brainer really - you get to listen to awesome Swing and Jazz music, join in some excellent girlie chat and maybe even grab yourself a super prize! Broken Hearts DJs rocking Devine necklaces.